yesterday was definitely wild. and i got to the fox studios and went straight to hair and makeup where i read over my talking points for our (yes, i am a nerd and printed talking points) and sat there telling myself it was going to be fine. i had just never done live TV before…actually i’ve barely done any TV. i kept thinking maybe i would swear, or fall or call the host the wrong name on accident. and if you watch the video i accidentally tell prom students to get together and make flower corsages and drink mimosas!! which i didn’t even realize i said until my boyfriend texted me “awesome job babe, you killed it! except for the part where you encouraged underage drinking! ha!” i had to just laugh that one off. Well done! It’s really great and i couldnt see any nerves. Hopefully I’ll be at the event this weekend. Cheers! Congrats!! How exciting. I would definitely mess that up. Well done. I love you for the mimosa slip. Amazing. Heading over to watch now. p.s. your hair has never looked better! I love it. Haha, nothing ever goes as planned, but at least you looked GORGEOUS! hope this helps: if you want to embed the video you should grab the embed code from the gdla site and insert it into your post via the html tab (not the visual tab). you should also probably change the values in the embed code from 630 and 355 to 550 and 309, respectively, to fit your container here. SHUT UP! That is so flippin cool!I am popping over now to watch. You are so inspiring. Awesome! That’s so exciting to be branching out and trying something that is out of your comfort zone! What’s next, designlovefest the show? Please, please, PLEASE tell me how you did your hair! Awh! You did such a good job! Congrats on this!! Hahaha I think everyone understands the mimosa thing! This is just so exciting! you’re adorable! you did such a good job and acted super cool. (were you even nervous?!) i really like this idea and now i want to go get a fresh bouquet and get to work. way to go! You guys did such an awesome job! I tried watching from work but it didn’t end up working out, so glad I could see it online! 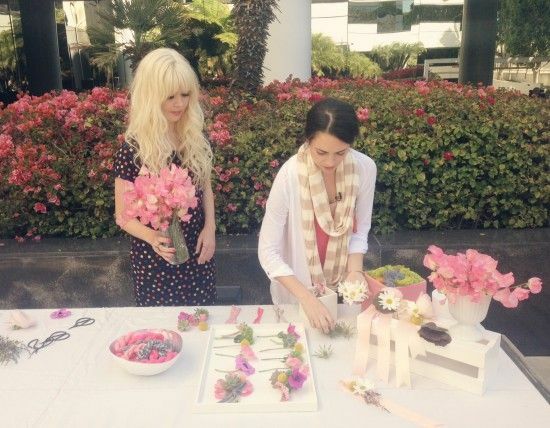 I really love adding flowers to everything so this segment was so spot on for me. So happy to be celebrating fun mile stones with you like being on TV for the first time AND totally nailing it! Can’t wait to see what’s next! heres the link to the class! You were so great! Mimosa thing was totally understandable. Any way you could do a tutorial on your hair??? I mean WOW! It was such a nice thought and cute flowers and all but the host is kind of annoying! She wouldn’t let Bri and Kristin finish talking, always interrupting… Bri looks fabulous as always though. Here is the embed code. Kind of messy, but it should work! thanks guys that would be so cool!